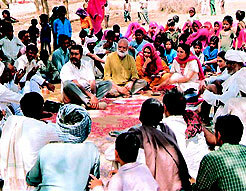 Bodh Shiksha Samiti (here after referred to as Bodh) evolved from experiences of collective action that helped establish a community school or bodhshala in Jaipur (Rajasthan, India). The school, initiated in 1987, was the result of a unique partnership between the Gokulpuri urban slum community and a group of likeminded men and women. The bodhshala reaffirmed the group’s belief that quality education was an inalienable right and that deprived communities possessed the strength to translate this vision into reality for their children. This belief has continued to shape all institutional efforts. Today, Bodh is recognised as a pioneer in the field of education for the urban deprived with growing expertise in the rural domain as well. It has also gained the stature of a resource agency for providing training and other support focusing on aspects such as child centred pedagogy, community involvement in education etc. Its key strength lies in its emphasis on learning from varied community settings and classrooms. This process of learning is aided by its network of bodhshalas (urban and rural), the innovative Manas Ganga Schools (Senior Secondary Residential Girls School, Pre and Primary School) and the work with the government schools. Overall, Bodh is engaged in programme implementation (in urban slums and rural habitations), evolving and refining teaching learning processes, professional development and other stakeholder trainings, research and documentation, networking and policy advocacy. It reaches out to more than 26,000 deprived children (urban and rural) through its bodhshalas and government schools in Jaipur and Alwar districts, Rajasthan, India. It has touched the lives of many more children through partnerships with likeminded NGOs and agencies across the country. All this has been possible through the collective efforts of many stakeholders. These include communities, local self governments (rural and urban), the Government at central and state levels, teachers, programme partners, academic experts and institutions, countless supportive individuals and many other bodies/agencies. Above all, the active participation and interest of children has lent a special (and continuous), sense of vibrancy, joy and fulfillment.